The new paper draws a link between the supernovae and the extinction, and suggests that particles called muons were the guilty parties. The evidence is not only in the fossil record, but in a layer of a radioactive type of Iron deposited on Earth about 2.6 million years ago, called Iron 60. The evidence is also out in space, in the form of an expanding bubble feature created by one or more supernovae. So what do these specifics tell us? First of all, let’s talk iron, specifically, iron 60. Iron 60 is an isotope of the element iron. An isotope is simply an atom with a different number of neutrons in its nucleus. All iron has the same number of protons—26—and an equal number of electrons, also 26. But its number of neutrons can vary. Most of the iron in the universe, including here on Earth, is iron 56. Iron 56 has a stable nucleus of 26 protons and 30 neutrons. Iron 56 is stable, meaning it’s not radioactive and it doesn’t decay. But here on Earth, there’s also some Iron 60, with an unstable nucleus containing 26 protons and 34 neutrons. It’s radioactive, and decays down to eventually become nickel. There’s Iron 60 residue at different times throughout the geological record, with a big spike at about 2.6 million years ago. But here’s the thing: any iron 60 that was part of Earth when Earth formed would have long ago decayed down to nickel. There would be no trace of it left. “As far back as the mid-1990s, people said, ‘Hey, look for iron-60. It’s a telltale because there’s no other way for it to get to Earth but from a supernova.’” – Adrian Melott, University of Kansas. So if there’s a spike of iron 60 2.6 million years ago, it had to come from somewhere. And that somewhere could only be space. And since supernovae are the only thing that can create iron 60 and spread it out through space, it has to be from a supernova. But the iron 60 didn’t kill the large marine animals. Sure, it’s radioactive, but it’s not the culprit behind the extinction. It’s just evidence of a supernova at the same time as the extinction. There’s another piece of evidence supporting the “death by supernova” theory: a giant bubble out in space. The feature is called the Local Bubble, a hollowed-out cavity in the interstellar medium. The interstellar medium is the matter and radiation that exists in the space between star systems, within a galaxy. It’s basically gas, dust, and cosmic rays, and it fills in the space between solar systems. 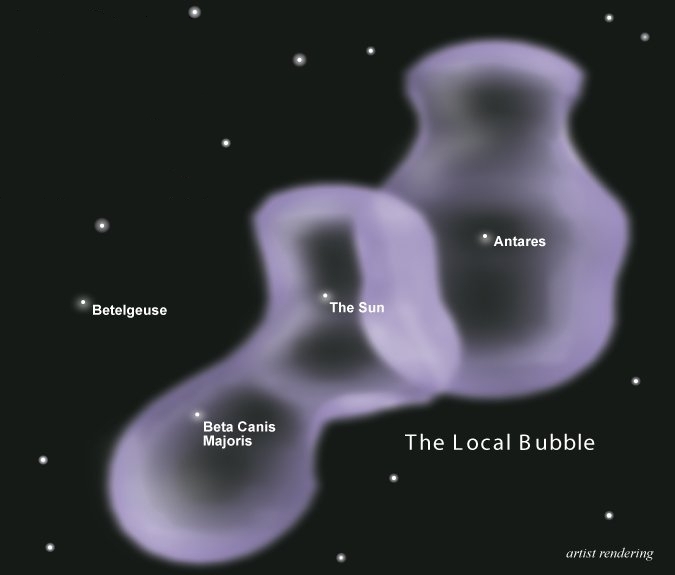 The Local Bubble is a shape that’s been hollowed out of the interstellar medium by one or more supernovae. Our Solar System is inside it, as are stars like Antares and Beta Canis Majoris. There’s no other event that could have hollowed out the Local Bubble. When a supernova explodes, the shock wave clears out the gas and dust in its area, creating a bubble. The bubble is not completely empty, there’s some very hot and very low-density gas left in it. But most of the gas clouds are gone. So if the evidence, both the Local Bubble and the Iron 60, supports the occurrence of multiple supernovae causing the Pliocene marine megafauna extinction, what exactly was the mechanism of that extinction? Iron 60 can’t do it, and neither can a bubble out in space. So what happened? Melott and his team say it all comes down to sub-atomic particles called muons. “The best description of a muon would be a very heavy electron—but a muon is a couple hundred times more massive than an electron.” – Adrian Melott, lead author, University of Kanasas. When the supernovae spread Iron 60 on Earth, it wasn’t the only thing that came raining down from space. There were also muons. Muons can best be describe as “heavy electrons” according to Melott. And though we’re constantly receiving muons from space, most of them pass right through us harmlessly, with only the odd one interacting with us and making up part of the radiation we’re constantly bombarded with. But that changed when the supernovae exploded. There would have been hundreds of times more muons than the normal background number. And for larger animals with larger surface areas, that means a much greater exposure to radiation. So, distant supernovae caused a massive spike in the number of muons striking Earth, raising the incidence of cancer, especially in large marine animals. And since the deeper an animal is in the water, the more protected it is, the extinction for larger marine animals in shallower coastal waters was a by-product. One particularly large—and infamous—marine animal went extinct during the Pliocene marine megafauna extinction: the Megalodon, one of the largest and most powerful predators ever to live on Earth. 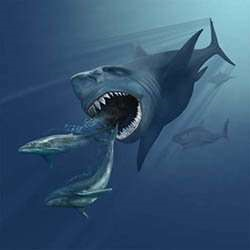 The Megalodon, a bus-sized shark and one of the largest predators to have ever lived. A shower of muons may have caused its extinction, along with other megafauna. Image Credit: Wikimedia Commons. As Melott acknowledges, there is some speculation going on here. There may be other reasons for its extinction, including the cooling of the oceans as a result of an ice age. The sea levels would also have lowered during an ice age, meaning that the species lost good nursing areas. The Megalodon wasn’t the only species that went extinct during that time. In a 2017 paper, researchers documented the extinction of other marine megafauna including mammals, seabirds, and turtles. But could one or more supernovae have caused all this? Earth was in a period of climate variability at the time, so it’s difficult to tease out the individual effects that supernovae and climate change would have had on extinction. And another study suggested a different supernova link to the Pliocene-Pleistocene extinction. In a 2002 study, researchers looked at the Local Bubble, and at the Earth’s Iron 60, and concluded that both were a factor in the extinction. But they posited a different mechanism. They said that the supernovae caused a surge in ultraviolet light to strike Earth, killing small creatures at the base of the food chain, and that in turn led to larger marine megafauna dying off. For Melott and his team, the supernovae muon theory is all a part of it. 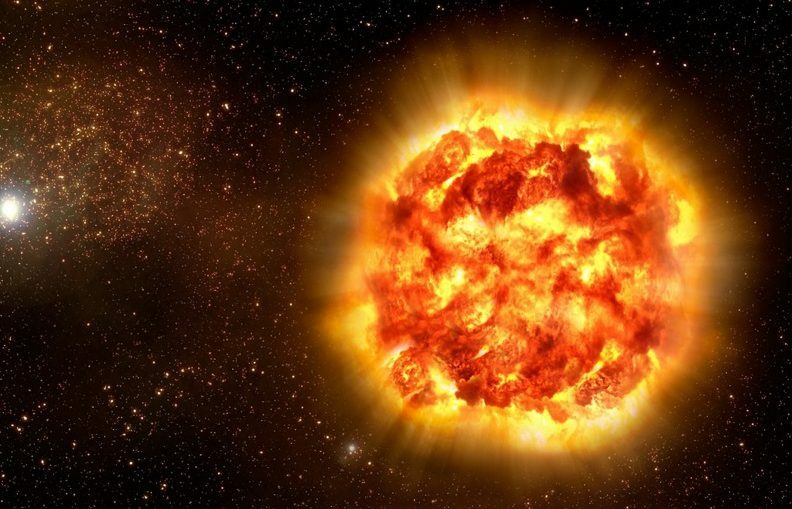 The University of Kansas researcher said the evidence of a supernova, or series of them, is “another puzzle piece” to clarify the possible reasons for the Pliocene-Pleistocene boundary extinction. Scientific Paper: The Pliocene marine megafauna extinction and its impact on functional diversity.